SPACE STATION NATHAN: Hazardous Monday! 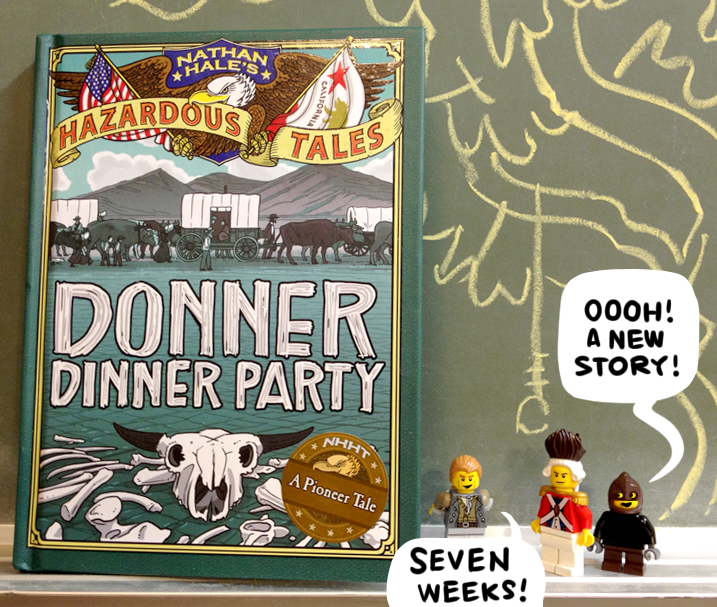 Donner Dinner Party is here! Very excited for this book, Nathan; I'm teaching a Civil War course to 25 teachers this week, and we bought them all One Dead Spy and Big Bad Ironclad. One Dead Spy to set up why exactly Nathan Hale, the Provost and Hangman would be telling a Civil War story, and Big Bad Ironclad...well, because that's the Civil War Story. I just have to know. Did LEGO make those minifigures for you? And can we buy them? How awesome is that! Going to Amazon to see if we can preorder the Dinner Party! It would be excellent copies for all 4th Grade Utah classrooms about Utah history. They did pass through...And I hear some Mormon Scouts were sent to bury the aftermath. Haha. I wish LEGO made custom figures for me. N, these are my own creations. Hale is mostly a Pirates of the Caribbean body with Hawkeye (from the Avengers) hair, the Provost is an old Pirate-theme redcoat, with a series 10 George Washington hair piece. Hangman is a mix of all kinds of things, and his face is photoshopped because LEGO doesn't make a mask like that. The Mormon Battalion was one of the first groups through Donner Pass after the rescue and snow melt. They did a lot of the burying and cleanup (the rescue groups didn't, there was still too much snow). Fun facts! And Thanks, Quinn! Be sure to point out that the map error (AKA Confederate Kansas) has been corrected in newer editions, and apologized for here nd on the Hazardous Tales site. That Cavalry Builder set is fantastic! I have it on my shelf right now. It's all I can do to not buy ten more to have 30 little cavalry soldiers. Good stuff. I think I've bought 5 of the Cavalry Builders myself...that MAY be enough. I'm really hoping I'll magically stumble across some on clearance in about six months. You never know. We introduced our group of 25 teachers to NHHT this morning and they loved them--also showed them the blog and the Facebook page with all of the one-shots, the Bleeding Kansas mini-comic, and your Kansas Apology Tour. I was probably gushing about NHHT a little overmuch. Whatever. I know good history resources when I see 'em. And these teachers are loving them.